The Energy Freedom, with the tug Gulf Majesty, attained speeds of over 12 knots in a ballasted condition on its maiden voyage. Freedom was designed, engi- neered and built by Bay Ship- building Corp. in the record time of nine months and seven days from the date of contract com- mitment. Meyer, commended the shipyard for the outstanding delivery per- formance, high quality of work- manship and for not initiating a single shipyard change order. Energy Freedom loaded its first coal cargo at Conneaut, Ohio, only a few days after delivery. Energy Freedom has an over- all length of 550 feet, beam of 78 feet, depth of 50 feet, a total hold capacity of 1.5 million cubic feet and a summer deadweight cargo capacity of 33,700 tons. The ves- sel is American Bureau of Ship- ping classed + A-l for unrestrict- ed ocean service. Gulf Fleet's tug Gulf Majesty, attained speeds over 12 knots in a ballasted condition on its maid- en voyage. Shipbuilding Corp. with a sec- ondary 49-foot raised pilothouse. Bow and side bumpers were in- stalled to convert the tug from a towing to a combination notch / towing tug. Corp. of Sturgeon Bay, Wis., one of which is a 44,000 cargo dead- weight self-unloading phosphate carrier. Outlook In Gulf Area Is 'Best Ever' "The outlook for marine con- struction in the Gulf of Mexico in the 1980s is, in my view, not only good, it is great," Robert E.
Future of the Gulf South." Noting the Louisiana Gulf was the birthplace of offshore oil and gas development more than 30 years ago, Mr. Howson said: "Normally, when an area has been developed for 30 years you would expect the oil and gas to have been depleted to the point that production is in decline. Such is not the case in the Gulf." Robert E. Howson to the most intense drilling ever in the Gulf, the demand for mo- bile drilling rigs has created back- logs to 1985 at the Gulf Coast yards that build the rigs, accord- ing to Mr. Howson, and the de- mand for vessels used to service offshore rigs and platforms is up. 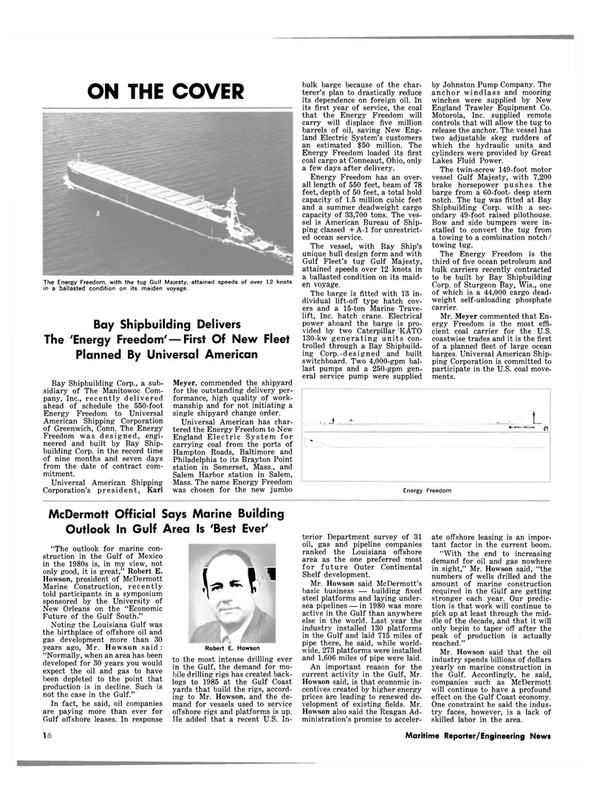 Mr. Howson said McDermott's basic business — building fixed steel platforms and laying under- sea pipelines — in 1980 was more active in the Gulf than anywhere else in the world. Last year the industry installed 130 platforms in the Gulf and laid 715 miles of pipe there, he said, while world- wide, 273 platforms were installed and 1,606 miles of pipe were laid. An important reason for the current activity in the Gulf, Mr.
Howson said, is that economic in- centives created by higher energy prices are leading to renewed de- velopment of existing fields. Mr.
Howson also said the Reagan Ad- ministration's promise to acceler- ate offshore leasing is an impor- tant factor in the current boom. "With the end to increasing demand for oil and gas nowhere in sight," Mr. Howson said, "the numbers of wells drilled and the amount of marine construction required in the Gulf are getting stronger each year. Our predic- tion is that work will continue to pick up at least through the mid- dle of the decade, and that it will only begin to taper off after the peak of production is actually reached." Mr. Howson said that the oil industry spends billions of dollars yearly on marine construction in the Gulf. Accordingly, he said, companies such as McDermott will continue to have a profound effect on the Gulf Coast economy. One constraint he said the indus- try faces, however, is a lack of skilled labor in the area.